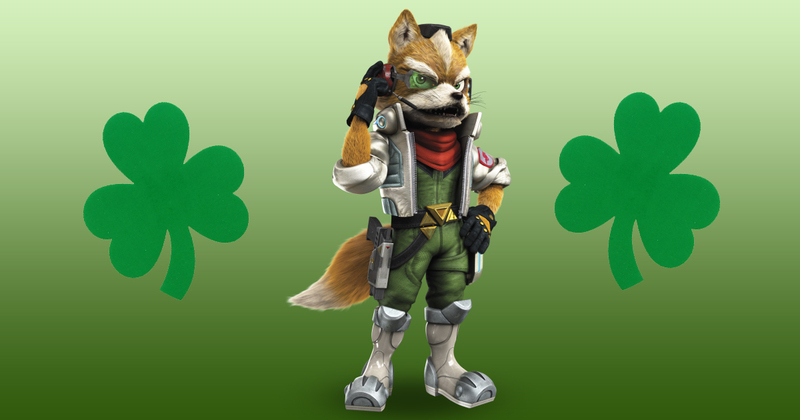 Today, for St Patrick’s Day, we want to honor the video games world’s most Irish character of all: Fox McCloud. You may know him from his appearances in Star Fox, Star Fox 64 and the Super Smash Bros. series, sporting his trademark green uniform. But what you don’t know is that the red head, who comes from a long line of McClouds in Ireland, wears his pride on his sleeve. According to the creator of Fox, Shigeru Miyamoto, when our furry hero isn’t shooting down bad guys in outer space and fighting against race car drivers in Final Destination, he’s screaming about how Mayo’s playing and he’s drinking holy water he imports directly from Knock. Even though his father Jimmy McCloud abandoned him when he got trapped in a black hole, Fox has oodles of love for his heritage. Of course, Star Fox isn’t only about Fox and his Irish heritage. Fox’s two best friends in the galaxy are the anthropomorphic bird Falco Lombardi, an Italian, and the anthropomorphic frog Slippy Toad, a devout conservative Jew. Along with their fourth teammate Peppy Hare, who none of the team particularly like as a result of him shagging Fox’s mom Mary McCloud after Jimmy’s death, the team quite obviously represents those from ethnic groups who emigrated from Europe to New York City in the early twentieth century (Irish, Italian, Jewish, and Rabbit). But the Star Fox series represents both sides of the Irish coin. Despite how well our hero Fox McCloud touts his heritage, Nintendo wanted to showcase the dark side of nationalism with their Irish villain Wolf O’Donnell. Wolf’s character is the natural antagonist to the Star Fox team due to his strict Catholicism, which pits him against the diverse group he fights against. He further represents the negative stereotypes of Ireland with his uncontrollable temper and decaying teeth as a result of drinking water contaminated by lime. Furthermore, wolves are known to eat birds, foxes, toads, and rabbits. Nonetheless, Wolf’s display of negative Irish stereotypes only makes Fox’s persona as a champion of his homeland shine brighter. So today, we’re honoring you, Fox! FIYYAAAA!!!! Written by Jeremy Kaplowitz and Liam O’Malley.